We took a long trip in our travel trailer this summer. Some of my friends told me to take my sewing machine and a project, so I did! Normally when I'm out on vacation, I don't want to be cooped up in inside a trailer. Well, anywhere inside actually. But I learned that the weather doesn't always cooperate, your husband needs a break to go fishing, and/or you're not able to go anywhere because you're exhausted. I'm never too exhausted to sew a little bit, though. I tried one of those modern techniques where you sew a scrap of fabric to the corners of squares. My stash is loaded with teal green and light turquoise, plus black and white prints. So that is what I selected. I did a little bit of cutting out before we left to make it easier to pull out the project for quick sewing here and there. 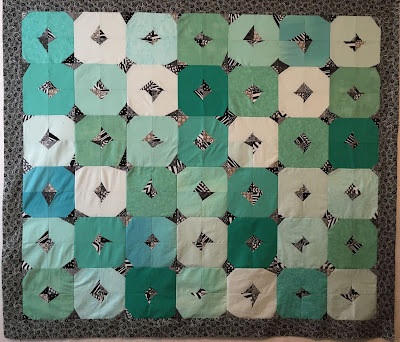 And my inspiration was from "Diamonds in the Rough" pattern by Jenny Rekeweg in Quilters World magazine from the Winter of 2013. After we got back, I sewed together the blocks into a 57.5" x 67" top. Although the pattern didn't call for a border, and modern quilts often do not have a border, I decided to add one in black and white prints to give it more stability on the edges. Final size is 63.5" x 73". It's not quilted yet, but I like the top.